Wait! What? Vinegar is not a great natural cleaner? Before you get too concerned, read what we have to say about how to use or NOT use vinegar. 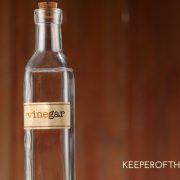 Using vinegar as a multipurpose all-natural cleaner may very well have been one of the first things you read or learned when beginning your journey toward green and natural living. I know it was for me. After learning about vinegar as a natural cleaner, I urgently ran to the store and picked up a 2-gallon jug of white vinegar and an empty spray bottle and came home to start using this insanely cheap and miraculous non-toxic cleaner all around my home. After all, it can clean pretty much anything around your house. There are many uses for vinegar, right? I have to admit, after a few weeks of using vinegar for cleaning around my home I was underwhelmed, and my husband was annoyed. He really detests the smell of vinegar and would be perfectly happy if I never used it at home again. I found that the vinegar did work really well for certain things, like de-greasing the range hood in the kitchen, cleaning mold and mildew in the bathroom, cleaning and descaling the coffee maker, replacing Jet-Dry as a rinse aid in my dishwasher. But for actual cleaning, I felt like it really didn’t work very well. I would spray it on the sink in the bathroom, on the kitchen counters, or onto the floor and feel like I had to use a lot of elbow grease to actually get them clean. 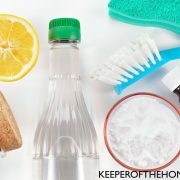 Because of that, and the fact that my husband didn’t want me to use vinegar around the house, I switched to using a homemade Multipurpose Cleaning Spray to clean all around the house instead. 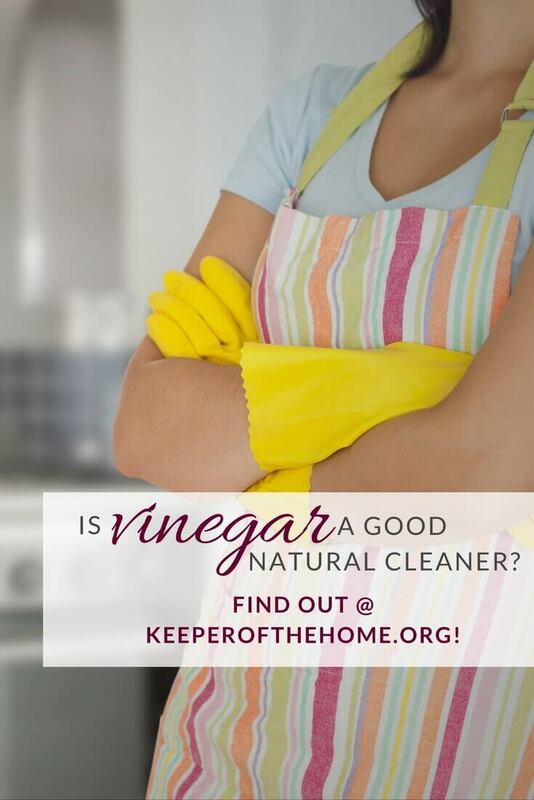 Recently, as I was doing some last minute research, I came across some interesting information regarding using vinegar as a natural cleaning agent. Myth #1: Vinegar is an effective cleaner for removing dirt and grime around your home. Despite all of the touted benefits of vinegar from just about every green and natural living blog, book, website, or expert (including myself until recently), an article published on the Consumer Reports organization site found that vinegar is not the best at soil (dirt) removal. Well, let’s be honest, I’m not really willing to work harder. I spend enough time cleaning as it is. And I would like to know that the products I’m using are actually cleaning the surfaces and not just wiping the dirt around. When it comes to actual cleaning, just like with washing our hands, basic soap and water are most effective for truly cleaning surfaces of dirt and grime, so a homemade cleaner makes the perfect cleaning solution. 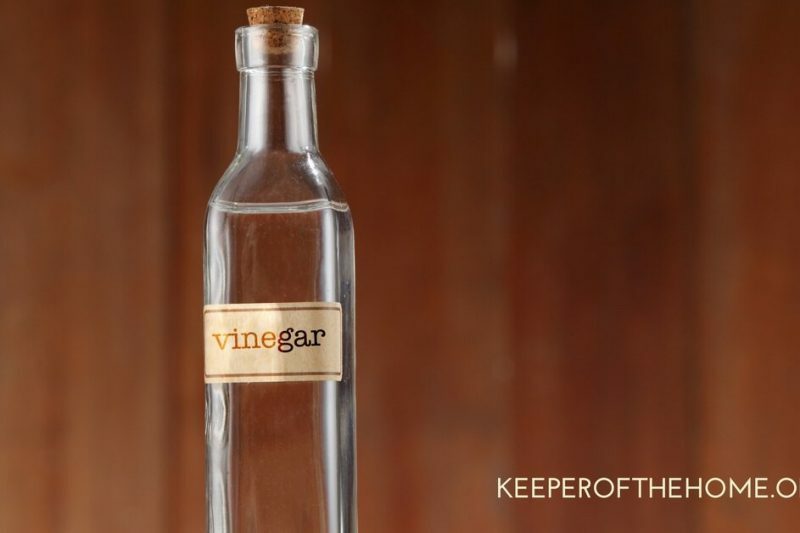 And while the post did determine that vinegar was not effective at removing dirt, it did find that it was effective in removing microbial contamination, and this is why vinegar is touted as a natural disinfectant. So vinegar definitely still has an important role in a green and natural home. It’s best to use vinegar as a rinse to help to disinfect a surface after you have cleaned it with a soap-based cleaner. Now that we know that vinegar is not such a great cleaner to use around the house, I want to dispel a few other myths about cleaning with vinegar. At a cost of about 5-cents an ounce, vinegar is one of the most cost-effective agents you can use in your home…if you use it correctly. I see a lot of homemade cleaning recipes that call for using castile soap and vinegar together. 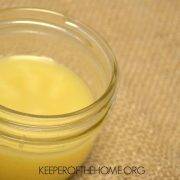 In fact, for a long time, my most popular post for homemade disinfecting wipes included both castile soap and vinegar in the recipe. If vinegar is a great natural cleaner (it’s not) and castile soap is a great natural cleaner (yes, it still is) we can mix them together for even greater cleaning power, right? Then I read this post, and did a little experiment of my own, and found that vinegar and castile soap really don’t mix together at all. In fact, it turns into a kinda gross, curdled mess; not something you want to be cleaning your house with! This myth is a relatively new one for me as well! I mean come on, looking at that amazing fizzing action – that has to be an equally amazing natural cleaner, right? Unfortunately, the answer is no. There are many more homemade cleaning solutions you can use to clean all around your home. You’ll find LOTS of easy recipes for homemade natural cleaners and instructions for making and using them in this collection we’ve pulled together. 9 Simple Ingredients That Will Clean Your Entire House! I have trouble lately trying to read your blog. The ads keep popping up over the content – very annoying. Get an adblocker. The best one I’ve ever seen is uBlock Origin. Uses very little CPU or memory. Just google it, it’s free. I really enjoyed reading an article that did not give vinegar all the glory and gave us an alternative. Vinegar as you stated has it uses and jobs that it is very good at but it is not master of the universe. The whole castile vinegar stuff is gross in my opinion and while i am glad it works for some it just does not do it for me. We use castile and water with tea tree oil most of the time for dirt and grim and vinegar with a lot of lavender oil to sanitize Castile and baking soda make a nice scrub for toilets. How much H202 do you use??? to the 1 parts soap and cream of tartar…Please and thank you. She had mentioned to spray the peroxide over the surface after rubbing the castile soap & cream of tartar mixture over the surface. I’m guessing it doesn’t have to be an exact amount. 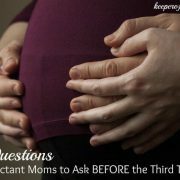 Hi – great information in this article. Wondering if I can replace cream of tartar (which I rarely have on hand) with baking soda (which I always have on hand) in your home made recipe and get the same results. Thanks for sharing your experiences with us! I love the combination of vinegar and baking soda because they never disappoint me. Whether it is a cleaning task or getting rid of nasty stains, vinegar is the best solution for every problem. You no longer have vinegar or baking soda after they react and neutralize each other. If you have an excess of one then of course it will remain unchanged. I agree! Especially in the bath tub and shower. I pour straight vinegar onto a wet cloth wipe down all areas. Then wipe on the baking soda. Grime literally melts right off. Heated Apple cider vinegar mixed with baking soda will unclog probably any clogged drain or toilet problem. Works BETTER than any professional Plumber solutions…per a plumber and per experience. So that dispels what is said in this article about them being ineffective together. I started using a mixture of mostly vinegar and a little bit of lemon juice to clean everything in the house–the counters, the bathroom, even to mop the floors (laminate) and it has done an amazing job of getting all the nasty stuff off. Of course, with the toilet, I run over it with a bleach wipe afterwards, but everything else is clean! My apartment may smell like vinegar after, but at least I know it’s clean and safe. Sodium chloride is salt. Not sodium acetate. Mike, the wording of the article is a bit confusing, I agree. Sodium acetate is a chemical salt – an ionic compound formed by the neutralization reaction of an acid (acetic acid) and a base (baking soda, or sodium bicarbonate). Table salt is a different sodium salt, sodium chloride. Sodium acetate = CH3COONa, sodium chloride = NaCl. You are correct. By avoiding any mention of ingredient chemistry, many flawed clueless housewife DIY recipes and remedies get perpetuated ad Infinitum. It’s quite shocking how little the general public understands about products they use. A salt is any ionic compound formed by the reaction of an acid and a base. So table salt or Sodium Chloride (NaCl) and Sodium acetate, (CH3COONa) are few of the many salts around. I’m a little confused as you say not to use baking soda and vinegar together but then you send us to a link for easy homemade cleaners that mostly consist of baking soda and vinegar ???? 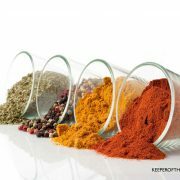 This post contradicts the first recipe in the ultimate home cleaning recipe linked to at the top. Is using vinegar and baking soda good or not? I’m substituting DAWN for Castille soap. Why would you use them together to clean anything? They neutralize one another. The products of the reaction are sodium acetate, water, and carbon dioxide. If sodium acetate had any value as a cleaning agent it would be sold as such. What’s a good natural diy cleaner for granite? What’s wrong with plain old liquid dishwashing detergent? Are you afraid that it’s not natural enough for you? Millions use it and don’t seem to be suffering any ill effects. For my granite, I use a spray bottle with 2 1/2 cups water, 1/4 tsp dish soap, 1/4 cup rubbing alcohol and 6-10 drops of an antibacterial essential oil, such as doTERRA’s On Guard. Probably Tea Tree oil would work, too. I have been using this for 5 years now. If I have some stuck on gunk in some areas, I will be generous with a rag with soap and water first. Then use my spray to kill germs. I love that recipe you gave instead of vinegar! Plus, I HATE the smell of vinegar so I’d way rather do that recipe! I completely disagree about the vinegar and baking soda being useless. It cuts through sticky grease around stove LIKE CRAZY! Try it ladies. And the list of things you said vinegar does do is LONG. Of course you need something a little abrsive for a dirty sink bowl. If you use the baking soda dry – it’s a great scrubber! Especially if you first wipe the sink with vinegar. Wow! That sounds like a lot of vinegar. The worst thing about vinegar is the smell when it’s still wet. The best thing about vinegar, is after it’s dry it dries no more vinegar odor or other odors! The vinegar neutralizes all bad bad smells – that why I love it!! Cream of Tartar? Do you know how expensive a little can or bottle of that is? Yes, it’s expensive, but it works. Try to buy it in bulk at some stores. WinCo in Oregon sells cream of tartar in bulk. I will swear by vinegar sprayed on baking soda for cleaning grout. I use to use bleach and this works just as well without the negatives of using bleach. Just sprinkle on baking soda, spray with vinegar, let sit for 1 – 2 minutes and scrub with a grout brush. Wipe up with cloth (several times to get all the baking soda) and your grout will be like new. I was told by someone that the vinegar/baking soda was great for floors. Nope. I read online that vinegar is a deterrent for roaches. For perhaps that day, yeah. It definitely has some great uses, but as you mentioned here, mold in tile areas. Check. Degreaser. Check. I will say however, apple cider vinegar is a great skin cleanser, and for people with scaly scalp and dandruff *raises hand, I swear by it. I don’t like to use bar soap (or liquid shower gel) on my face, or especially for my ears. I learned from my European wife years ago (OK, I’ll say it–EX), to use vinegar for facial cleansing and around the ears. Forever I was getting soap suds stuck in my ears and they would crackle and pop for about a good five minutes after my shower, so using the vinegar (or witch hazel) for ear cleaning did the trick. It wasn’t until I started experimenting with vinegar on my scalp, shoulders, and back that I found out how great it really is! Every other day, I soak a wash rag in a vinegar/water solution (equal parts). I dab the rag on my scalp while watching the news. I spend a good ten minutes or so doing this. Then after, I do the same thing with my shoulders, upper back, and pretty much everywhere if I feel like it. It completely eliminated any scaly scalp problems, and pretty much ended acne anywhere. Sorry if that was a bit off the topic of ‘cleaning’, but vinegar is better for the body, use wise, I think. Please edit and add the concentration you are recommending as a percentage. *As a note to anyone inexperienced in using hydrogen peroxide, It’s available at typically 3% & 6% concentrations from Pharmacies (drug stores for those in North America) and also 30% – 50% concentrations from chemical supply companies. At higher concentrations it becomes less stable and learning how to store it correctly becomes a relevant issue. The oxidising and anti-bacterial/fungicidal action of hydrogen peroxide is determined by several factors which include but are not limited to UV light exposure, concentration and time. Lower concentrations require longer surface exposure time to be effective as an oxidiser and or anti-bacterial/fungicidal agent. Don’t take my word for it, be correctly informed by doing some light reading about hydrogen peroxide (it’s wonderful stuff) and any other chemicals you care to use around the house. Knowledge is power, and reading is the gateway! Using vinegar actually has benefits outside of just removing dirt that I didn’t see addressed here. I think that writing a post saying vinegar doesn’t work just based on your experience isn’t very thorough. I’ve never had any issues cleaning with a bottle of 1 part vinegar and 1 part water. There are also a lot of ways to scent it so you don’t smell vinegar while cleaning. It also doesn’t smell once it dries. As a side note: peroxide smells much worse than vinegar if smell if a problem for you. Using Vinegar might be great for cleaning, but at homes where you’ve kids, it’s not a safe option to use. There exists various multi-surface cleaner in the market. Still, I use a Puracy multi-surface cleaner to wipe off the excess dust, grime and to make the entire space germ-free for my kids. It is plant based and has a refreshing fragrance of green tea extracts, lime..
What’s not safe about vinegar?! It’s literally edible unlike most of the ingredients in Puracy. I usually use baking soda, vinegar, hydrogen peroxide and essential oils. Actually, essential oils are my favorite one for cleaning. This post references an article from consumerreports.org, which is a known mouthpiece for the big industry, is biased and not at all trustworthy. The ratio of water (and what kind of water you use), to vinegar, to baking soda is very important. 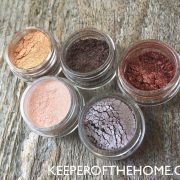 Mixed properly, it will remove the need for most of your household chemicals and do a better job cleaning. With regard to the smell of vinegar, it smells a heckova lot better than the noxious, carcinogenic chemicals we use on everything for cleaning products. In fact it’s a nice smell knowing that you are not getting sick just by smelling it. 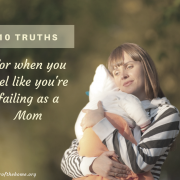 I don’t know about the trustworthiness of this blog anymore.